It is so important that your cat is able to entertain themselves at home whether you're there with them or out all day shopping. Keeping your fluffy friend physically and mentally stimulated is a huge part of keeping them healthy! And what better way to make sure your cat always has something to do than giving them a cat tower to climb and play on? There are lots of different types of cat towers and finding the right fit for your feline friend can seem overwhelming. To help, we've analyzed some of the top towers in the game. 1. What Is a Cat Tower? It's pretty self-explanatory: A cat tower is a tower-like piece of furniture with platforms and scratch surfaces designed to be a fun climbing and play toy for your kitty. Investing in one may encourage your feline friend to climb on and scratch less any furniture that is not specifically designed for them. 2. Where Can I Buy One? You can buy these towers at any pet store or at any department store that has a pet department. Finding the right cat tower for your home can be influenced by several factors: how much you are looking to spend, how many cats you have, how much space you have, and the temperament and preferences of your cat. Hopefully, by seeing a few examples of various towers, you'll be ready to decide which is right for you. Because cat towers can vary from small to very large, you can expect to spend somewhere between $25-300 on a cat tower. This 5-foot tower comes with lots of places for your kitty to play and relax. It has multiple levels, hammocks, and cozy, hidden nooks for your cat to explore and rest in. Because it's so tall and has so many features, it's a great option if you have more than one cat you need to please. With multiple color options, you can find one that fits your home decor. This tower is perfect if you want to get your kitty a cozy space to play in, but don't have a ton of room. This unique cat tower easily folds up for storing away when not in use! This tower stands almost five feet tall and offers room to climb, play, and hide, for one or more kitties. While it is undoubtedly a good option when compared to the first tower we've checked out, the Go Pet Club, the Armarkat Classic cat tree has considerably fewer fun areas for your kitty. This cat tower is almost four feet tall, and it's perfect if you're looking for a tower with a bit of elegance. It pairs smooth wood finishing with rope-wrapped scratchable posts. The question is whether that's comfy for your kitty? Some cats love the feel of a hard surface beneath them, but others just want to play on soft, cushioned areas. Either way, your kitty will certainly love to sleep and play on this tower. Four and a half feet tall, this tower is a playtime winner. It's packed with lots of areas for your cat to play and get cozy, as well as some great perches for your feline friend to watch over the home. Best of all, on the base of this tower there is a ball in a box filled with holes the perfect size for cats' little paws to fit in. Another great thing about this tower is that you can get it in multiple colors and styles. Each style has the same basic components arranged in a different way. Click through here and see which your cat would love most. Do you have a kitty that loves to cuddle and sleep, but doesn't play too much? If so, this tower is perfect for her. It's 52 inches high and comes with three comfy areas to curl up in, all set at different heights. This tower is designed to accommodate big cats that might have a hard time fitting in the areas of other towers. If you or your cat is a fashionista, this tower is a perfect choice. It's very stylish with its unique architecture and black-and-white pattern. Even though it's only about 30 inches tall, it provides a great space for your cat to play and lounge without the imposing feeling that the taller towers can give off. There are specific areas for your kitty to sleep, scratch, and play. Your furry friend will love the pom-pom and bell attached by a string and ready to be whacked around. This fun option is, as the name suggests, a tribute to redwood trees. It is very tall – over 6 feet, and has fake vines wrapped around the tower. If your kitty's favorite pastime is climbing as high as possible, this tower is the perfect choice. This stylish tower has a unique architecture with several sitting areas shooting off the central curving spine and a cozy hiding area at the bottom. The tower is certainly pleasing to the eye and has a beautifully colored wood finish on most the surfaces. 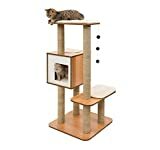 While your cat will absolutely enjoy this tower, a wood finish means that there is less space for your cat to scratch. While this sleek option has "cozy" areas for your cat, there are significantly fewer "fun" ones. 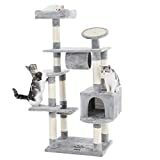 This tower is great because it has two main stems holding the levels, meaning more areas filled with fun things for your cat to do. 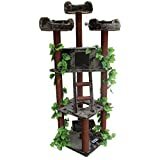 The SONGMICS cat tower is around five-foot tall and has several perches, scratch poles, and hidey-holes for your favorite fur ball and its large size means it's great for households with multiple cats. While the gray and cream color combination is appealing, if this palette isn't to your liking, there aren't any other color options. With so many options out there, trying to find the best cat tower for your furry pal can be overwhelming. But, with everything you do to keep your kitty healthy, making sure they stay active and happy is a big reason to invest in a tower. If you're feeling overwhelmed by all the different cat tower styles out there, try asking yourself some questions. How much room do you have for the tower? If you have plenty of space, you could get any tower you want. But, if you have limited room, you'll want a smaller one. 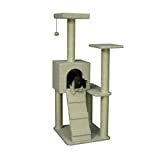 If you want to be able to put the tower out of the way, the Trixie Pet Products Miguel Fold and Store Cat Tower (pictured below) is the best choice for you. This one gives your kitty lots of play and lounge areas, but can also be easily folded up and put away if you need the extra space. Is it important to you that your cat tower be stylish and fit in with the other furniture in your home? If so, you may want to check out the Refined Feline Lotus Cat Tower, Vesper Cat Furniture, or MidWest Feline Nuvo Cat Furniture. These cat towers make a point of being fashionable in addition to providing your cat with everything it needs to be happy. If style is important to you, also check out the Kitty Mansions Redwood Cat Tree. While not "fashionable" in the sleek, modern way of the other towers, this option is great because the redwood-inspired tower creates a unique style with faux-vines wrapped around it. It also doesn't compromise on your kitty's comfort the way the other options might. Is your cat larger than average and more interested in sleeping and keeping watch over the home than playing? Then your cat will love the CozyCatFurniture Cat Tower. It has three levels for your cat to curl up on, and each area is specifically made to be large enough for the biggest cats. 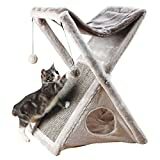 While this tower may not be the best option for kitties with tons of energy and that love to play, it's perfect for your lazy cat who is content sleeping and watching. 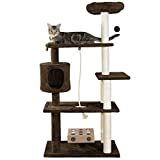 While there is a lot of personal preference involved in finding the perfect tower for your family, we have two favorites: the Kitty Mansions Redwood Cat Tree and FurHaven Pet Cat Furniture. The Kitty Mansions Redwood Cat Tree does a phenomenal job at mixing comfort and style. It doesn't compromise any comfort or fun for your kitty in the process of making a tower that you are proud to display. It's got lots of room and is great for more than one cat. Our number one favorite cat tower is the FurHaven Pet Cat Furniture (pictured). It uses innovative design to provide more than a handful of options and styles of the same main components. All of their styles include a game that will entertain your cat for endless hours—a ball inside a box filled with paw-sized holes. Your kitty will go crazy pawing the ball and trying to "catch" it. Filled with lots of other kitty amenities, we can't wait to see what fun cat toys and towers this company creates in the future. Finding the perfect toy or amenity for your cat can be hard - stay tuned via our website for more reviews and tips for buying the perfect toys and accessories for your pet!